"Five Stars. The Hypocrites tally up a stunning revival of this bleakly comic, Chicago-born musical adaptation... Geoff Button's brutal, bracing revival, a triumph of moody atmospherics and masterful performances... A dark gem of a production... The parts of the Hypocrites’ Adding Machine are individually striking; together, they make a hell of a sum." "And Button's highly creative production compensates well for the relative inaccessibility of the piece, as evidenced Sunday by the intensely enthusiastic audience. This may well be the best work Button has done. He puts his stamp on this remarkable piece of made-in-Chicago art and forges what feels very much like a Wicker Park tale of alienation and existential sorrow." "Highly Recommended... Now, under the entirely fresh, emotionally heated direction of Geoff Button – with outstanding musical direction by Matt Deitchman, rhythmically stylized choreography by Katie Spelman, and a cast totally at one with its warped intensity – The Hypocrites have grabbed hold of this show and made it their own. In many ways it is darker and more unrelenting than I recall the original being, and it grabs hold of you every second of the way with its mixture of pounding pessimism and surprising twists and turns." "But this Hypocrites revival may be even better: lighter and deeper, less sentimental and more cruel. Well cast, and featuring near-perfect musical direction by Matt Deitchman, Geoff Button's staging uses comic repetition to get at the abject horror of Zero's life." "Under the direction of Geoff Button, the cast pours their heart and soul into the piece, and it’s not a work that lends itself to that so easily... The cast is, appropriately, a well-oiled machine, and it’s beautiful to watch... Button’s staging is a feast for the eyes and right in line with the harsh world that ADDING MACHINE occupies." "Director Geoff Button has conceived a truly dystopian, dim, drab, despondent, deranged, dark, delightful to watch macrocosm. He pulls it off with aplomb." 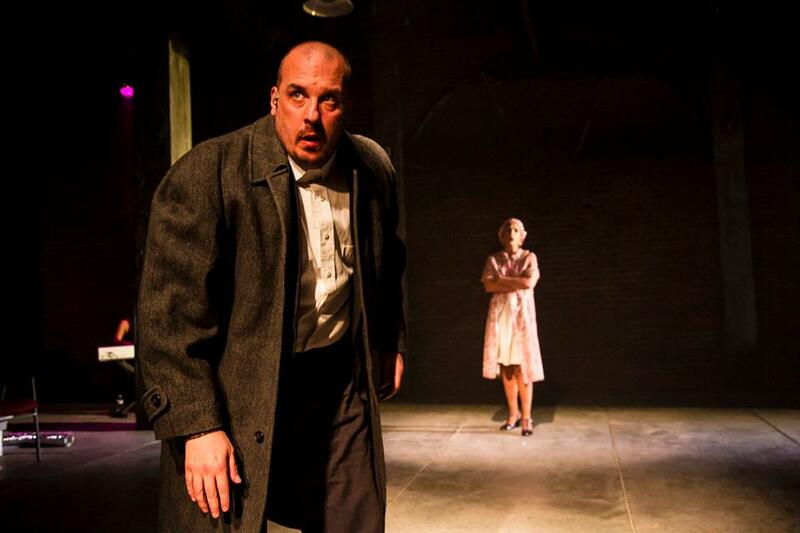 "The Hypocrites' take on Elmer Rice's expressionistic play is haunting and dissonant... In typical Hypocrites fashion, the ensemble is used to great effect. Geoff Button's direction emphasizes mankind's place in the machine." "The humdrum, day-to-day existence of a man who’s spent 25 years doing the same, boring job, lovelessly married to the same annoying woman, has never been depicted with more intensity... Directed by Hypocrites member Geoff Button, this new production is magnificently conceived, staged and performed." "Rice’s play was given a second life as a musical that began in—and now returns to—Chicago, where it finds an ideal home with the sensitive polymaths at The Hypocrites." "Adding Machine: A Musical is a powerfully staged and expressive production bursting with energy... Button’s strong direction and Katie Spelman’s mechanical choreography, in tandem with uniformly excellent work from the cast of nine, makes for a thoroughly engaging and nuanced exploration... Although this musical is a story concerned with murder, oppression and numbers, Button and his cast find much humor (albeit dark) in the proceedings... These touches, along with the episodic nature of the musical’s structure, help to keep viewers on the edge of their seat."